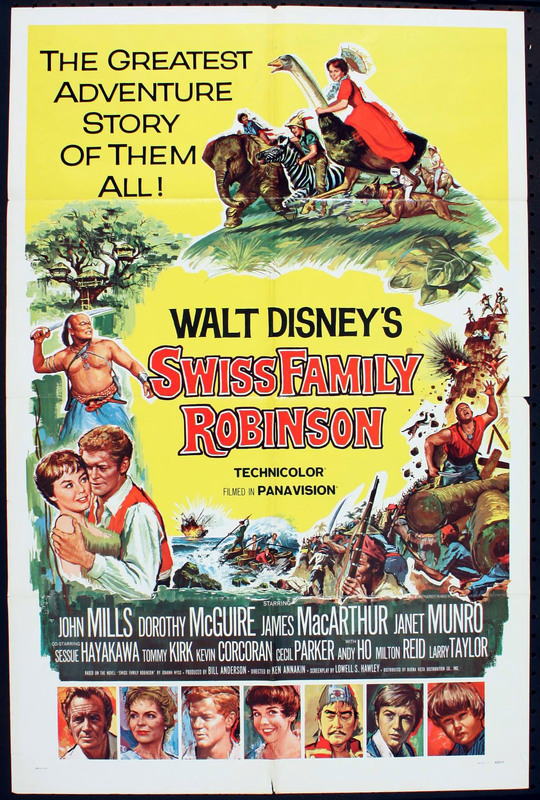 NOVEMBER DISNEY EXTRAVAGANZA #8: Swiss Family Robinson (1960) – dir. Ken Annakin | Films Like Dreams, Etc. Swiss Family Robinson is a film that, somehow, slipped by my radar as a Disney-loving child. Although it does make sense since, unlike my mom’s generation, I was more enthralled with the studio’s animated musicals than with their live-action family-centered dramas. Sure, I’ve seen such famous flicks as Mary Poppins, Popeye, Who Framed Roger Rabbit?, and more recently the Parent Trap remake; yet the bulk of their non-animated works of the 50s through 80s remain undiscovered by me. Swiss Family Robinson, therefore, is my way of trying to get my feet wet in unfamiliar territory. Sadly, my final verdict on this particular film is an exceedingly unimpressed one, as time has surely not been kind to this feature. The movie basically follows the unfolding of events after our titular family crashes their boat into an uncharted island – which is literally the very first thing that happens in this film. There is no fragment of exposition granted to us – familial personalities, conflicts, relationships, etc. – that could possibly influence our reaction toward this family’s accident. Initially, I was pleasantly surprised by this unusual pacing decision, as it’s a risky move that I’ve seen made by very few films. Very quickly, though, this turned into plain monotony, as these characters are revealed to embody some of the most painfully boring caricatures of a white all-American family. There is absolutely no sense of immediate panic that one would assume to come from such a dire situation, and while I understand that this film was targeted toward children, it is all the more difficult to genuinely enjoy with such hokey smiles plastered on their faces at all times. Hell, the Hawaii episodes of The Brady Bunch had much more realistic survival narrative than this trash. Frankly, this wouldn’t have even bothered me all that much if not for the way this film presents these individuals’ mistreatment of various animals as something that we, the viewers, are expected to find cute and heartwarming. I’m all for kids and animals performing in movies in comedic ways, but the various moments of potential animal rights’ violations portrayed in Swiss Family Robinson is troubling at best and nauseating at worst. I am not familiar with its source material and I understand that “things were different” in those days – hell, I’m even a huge supporter of Cannibal Holocaust, which inarguably presents such problematic aspects to an even worse degree. As a contemporary movie-lover and critic, however, the amount to which it discomforts me (and many others, I’m sure) is something that cannot really be ignored. There’s also an element of sexism that runs throughout the narrative that frankly, as a female viewer, cannot be ignored by myself. Realistically, the only active players of this film are the male characters, who are represented as strong, fearless, and generally the main characters we are expected to root for. Meanwhile, the women are basically caregivers and nurturers for this men; if they do get themselves involved in the adventure that goes on, it’s usually as a damsel in distress. Sure, this is far from the first or last film to operate on such tropes, but the fact that this is mainly marketed toward children is even more harmful and works to add this movie to the long list of others that perpetuate such ridiculous messages as the norm. The bulk of Swiss Family Robinson moves at a rather episodic pace, which I usually have no issue with in films unless it affects its overall enjoyability to a fault. I feel that this is exactly what happens here, and once a sense of genuine conflict actually kicks in, it’s even more unpleasant. In the final third, some actual antagonists are introduced to the story in the form of malicious pirates. Since these pirates of visibly Asian origin are the only non-white people in the whole film, this also reinforces the “us vs. them” narrative that has caused and continues to cause serious violence toward people of color to this very day. This is strengthened by the aforementioned fact that the film expects us to side with the white man from the very beginning. It is at these moments where the film completely sides with colonialist ideals, something that surely cannot be forgiven to any degree. In the end, are there any good reasons to watch Swiss Family Robinson? Besides all the negative points I noted, it’s poorly acted, boring as sin, and not very well photographed. Additionally, it isn’t really an “important” film; just one of the slew of other classic live-action flicks churned out by Disney studios. It may actually be better if this film were simply forgotten, lest it perpetuate even greater amounts of harm, intentional or otherwise. Stick to Mary Poppins. This entry was posted in November Disney Extravaganza, Reviews and tagged 1960's, Disney, Ken Annakin, November Disney Extravaganza, Swiss Family Robinson. Bookmark the permalink.